The Coolest Covers Album in 40 years? I don’t know why, but I’m fascinated with cover versions of popular songs and over the years have steadily built up a collection of albums and single tracks that is bordering on the obsessive and definitely sad. When I had my radio show I would always include one in each hour of the programme; as you would expect some worked and others were downright horrible; but never less than interesting. 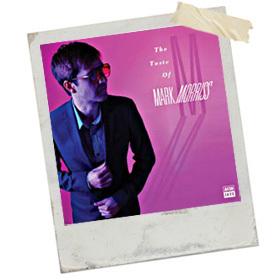 Which all brings us to Indie Pop-star and ex-Bluetone Mark Morriss’s latest release – The Taste of Mark Morris. I certainly didn’t recognise the opening track This Pullover but liked the Easy Listening 1960’s feel to it, especially the echoes of Adam Faith in the vocal department. The song is credited to Jess Conrad who was a stalwart of Saturday night TV when I was a lad. Next out of the traps is the Buffalo Springfield ‘minor classic’ Rock and Roll Woman and while there is an abundance of twangy Rickenbackers in the background; Morriss again effects a laid back tone to his vocals and I sensed a pattern developing. A bizarre mix of songs spanning the decades follows and I was in my element playing ‘name that tune’ – only recognising Duchess by Scott Walker (absolutely gorgeous interpretation) and Madonna’s Angel (lots of psychedelic guitar making an average song quite good). Songs I’d never heard before; Lucretia by the Sisters of Mercy, which gets a Mike Oldfield makeover and the Jesus and Mary Chain’s Almost Gold have quickly, become firm favourites. I’ve been a little non-plussed by You’re My Friend (Weezer) and the Pet Shop Boys’ Love Comes Quickly and REM’s Good Advices are both are a bit like a watered down Stone Roses for my liking. But played alongside everything else they actually work and the latter is a nice ending to a fun album. Many reviewers will point you back to Bowie’s Pin-Ups as a reference point for albums like this but I think this one owes more to the eclecticism of Bryan Ferry’s long lost masterpiece These Foolish Things in tone and style; but that record changed my life!